Noble Roman’s franchise has distinguished itself by its high franchisee failure rates, and its insistence on suing franchise owners once they fail. 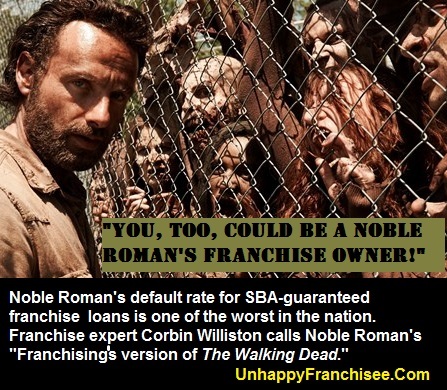 (UnhappyFranchisee.Com) Noble Roman’s, with a reported SBA Franchise Loan Default rate of 38%, once again has been named to our list of The Worst Franchises by SBA Loan Default Rate. They’ve also been criticized for trying to change their entire business concept to take-and-bake pizza. Are you familiar with the Noble Roman’s pizza franchise? Please share a comment – positive or negative – below. Pursing phantom royalties from defunct franchisees and pursuing franchise fees from new applicants, Noble Roman’s (OTC: NROM) is a puzzling case study in franchising. The franchisee attorney has asked the judge to reconsider, noting that the franchise agreement does not specifically provide for future royalties. The court awarded NROM $164,592 in lost future royalties for the period after the franchisees had gone out of business, and an additional $1,100,000 in attorney fees. A relatively small franchise system, NROM has used litigation as a revenue source and the position of their attorney Jeffrey Gaither should not be a surprise to any franchisee; the company has a history of litigation against franchisees. Common sense would suggest that prospective purchasers would stay far away from this franchise, but PT Barnum’s reputed dictum would seem to have been based on NROM franchisees; one analyst projects sale of 35 new franchises in 2014. Amidst the current debate over franchise relationship legislation, the decades-long saga of NROM illustrates the concern as to whether the government should intervene to save franchisees from their own failure to perform basic due diligence. The NROM franchise push began precisely because the company was having difficulty making money operating stores, and the franchisees have fared no better than the corporate owners did. In spite of a history of failure and no clause limiting future royalties, coupled with known high franchisee loan defaults, people continue to sink their life savings into NROM franchises. I grew up in Indianpolis and spent my early formative restaurant management years there. Noble was created on my college campus, IU Bloomington. It was a heavy pizza and beer neighborhood pizza place. It has some midwestern identity. Once the QSR pizza wars began, they lost ground quickly. By late 1990s, all their company stores closed. In the 2000s, of course they started franchsing. By 2009, they were involved with litigation with every one of their franchisees. The franchisees ran out of money and had one attorney after another, in Hamilton County Court.. Because of a pro hac vice admissions issue, the franchisees weren’t served well by their last attorney. They lost. NROM can list their liquidated damages all they want on their balance sheet, but you can’t get blood out of a turnip. Noble has now reinvented themselves to be a frozen take and bake purveyor, with “points of distribution” in various grocery stores. They are not really a restaurant and not a franchise. Investors should take proper note. Their SEC document talks to “points of distribution”, which is shelf space or a cardboard label, not a restaurant. Papa Murphy’s, which itself has just been sued, is the dominant take and bake operator and is about to IPO. ARE YOU A NOBLE ROMAN’S FRANCHISE OWNER OR FRANCHISEE? ARE YOU FAMILIAR WITH THE NOBLE ROMAN’S FRANCHISE OPPORTUNITY? SHARE A COMMENT BELOW. ← DAILY GRIND Coffee House Franchise: What Happened?